On April 27 last month, the world woke up to spectacular scenes of the premiers of North and South Korea embracing each other near the fortified border dividing the two countries. 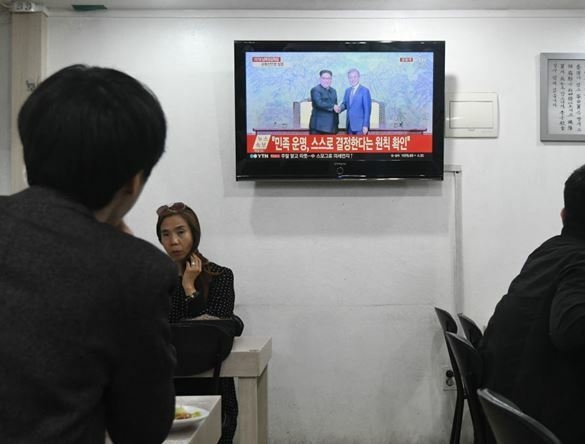 Kim Jong-un and Moon Jae-in later signed a comprehensive peace declaration that was hailed as a historic document on the path towards permanent peace in the Korean peninsula. The Panmunjom Declaration, named after the border village where it was signed, covered a broad spectrum of issues including humanitarian, political, military as well as nuclear. The ambitious document was met with jubilation across international diplomatic circles. A long way off from threatening North Korea with “fire and fury“, US president Donald Trump, in a self-congratulatory tone called it a proud moment. All other regional players including China, Japan, and Russia also welcomed the development. Thanks to this timely act of bold leadership, the critical threat of all-out war, as well as a possible nuclear confrontation in the Korean peninsula, has been averted, at least for now. Although multiple spoilers are looming in the horizon, particularly Trump’s much-anticipated summit with Kim Jong-un this summer, the declaration serves as a precedent on how open-minded diplomacy could bring forth positive results between the bleakest of rivals. Further west in the same region, some warmongers and Islamic sympathisers postulate risk of an all-out nuclear war cannot, however, be entirely ruled out. India and Pakistan – bitter rivals since the decolonisation and subsequent partition of Indian subcontinent 70 years ago – have also been locked in a military conflict of varying intensities. Every time it can be seen that the aggressor is Pakistan for some or other reason. The two nuclear-armed neighbours regularly exchange heavy artillery across their tense borders and are also engaged in acts of covert warfare against each other. The face-off has led to a steady loss of civilian as well as combatant lives. In recent times, the rivalry has spilled into Afghanistan, an already fragile state. Initially, it would be Pakistan which would use cross LoC artillery firing for pushing terror elements into Kashmir. Now Indian side has understood and is keeping Pakistan under check using the same technique. This is pressing hard on the economy and logistics of Pakistan Army. Moreover, the economic costs of this seemingly endless confrontation cannot be understated. Besides incurring military expenses that run into billions of dollars annually, the bilateral trade between the two economies has remained highly restricted. Although there have been multiple attempts to resolve the longstanding disputes between the two countries, the most recent dialogue process ended abruptly with the horrific Mumbai attacks of 2008. Indian side blamed it on Pakistan and produced phone recordings during the attack and also captured one of Pakistan’s citizens, Ajmal Kasab. Since then, no significant strides have been made towards lasting reconciliation. However, the recent peace deal in Korea could prove to be an essential framework for jumpstarting the virtually dead peace process between New Delhi and Islamabad. The broad scope of issues covered by the declaration is sharing many similarities with the India-Pakistan scenario. The most noteworthy part of Panmunjom Declaration is the intent for the establishment of a peace regime through multilateral engagements involving China and the United States. As demonstrated by the Iran nuclear deal, arbitrary withdrawal from a multilateral agreement becomes complicated in the event of a policy shift by any individual state party. Beijing and Washington, along with other members of P5+1 could play a pivotal role in bringing forth a negotiated settlement of disputes between India and Pakistan. More crucially, China’s ambitious Belt and Road initiative is bound to benefit from New Delhi’s inclusion into the China-Pakistan axis, and bring forth greater regional integration. The Korean leaders were also perceptive in realising the downsides of demonising propaganda vis-à-vis peace processes and ordered the immediate closure of all propaganda mechanisms near the Armistice Line. Across Pakistan; state, as well as corporate media houses, broadcast a toxic mix of jingoism and pro-war programming each night. In the name of national interest, anti-war stances are repackaged as anti-national agendas. Rational voices are often are berated or even censored. All content in Pakistan is strictly scrutinised by Military wing named ISPR. TV presenters, unlike official spokespersons, openly blame the (Indian side) neighbouring country for all that is wrong within its borders. This, in turn, increases popular hostility and appetite for a serious military conflict. However, media establishments in both countries have a responsibility to objectively report and analyze news rather than serve as propagandists for their governments. The central point of contention between the two countries is over the territory of Kashmir. The UN resolution of 1948 quite clearly states that progress of referendum is through the withdrawal of Pakistan military from Kashmir first, which is yet to be done. Thus the stumbling block for the peace process is at present in Pakistan and not India. While both claim the territory in full, they only administer parts of it. India and Pakistan regularly confront each other at international forums over this issue and have fought three wars to take total control of this region. In recent times, however, a newer third idea has been incorporated into the population in Kashmir has been increasingly disillusioned with the idea of merging with either of the two states and instead favoring total independence. This idea too is due to the indulgence of Pakistan based terror groups some of which have shown allegiance to Islamic State. This proposition becomes more urgent when we look at the unnecessary loss of life due to escalating militarisation and conflict in Kashmir, particularly in the part controlled by India. So far in 2018, at least one person has been killed every day in Indian-controlled Kashmir, including 51 individuals in April. The count on Pakistan side is unknown as media is strictly controlled by the military top brass using ISPR. In view of this deadly violence, a resolution in Kashmir perpetrated by Pakistan intelligence agencies, may not start soon. Pakistan’s demand of referendum is not possible as the Pakistan held side is totally changed from its initial demography whereas Indian side has retained its promise. Pakistan often threatens its nuclear prowess. It was already cautioned by an American President that not to show the nuclear button often as if ever Pakistan uses its nukes on India, India will ensure that Pakistan is obliterated from history in totality. Currently, at least people of Pakistan remain at the risk of total starvation in the event of even any nuclear instigation by Pakistan. Pakistan as a nation is not trusted worthy by any country in any field. However, the path towards peace between India and Pakistan has to commence with bold political vision and an open mind. The Indian government has shown its diplomatic elegance whereas the Government of Pakistan is totally under the control of its military. The Indian side has placed diplomatic moves which have very basic preconditions which are valid in the present environment.